Only those who regard healing as the ultimate goal of their efforts can, therefore, be designated as physicians. When Gyatso called to give me the list of medicines I was in the library, writing another one of these blogposts. I answered his call, speaking as quietly as I could in Tibetan but hoping he would still be able to hear me, across the planet. A few students looked up, annoyed, as my weird banter broke their concentration. Once outside, I greeted this familiar voice with enthusiasm. Gyatso, a Tibetan doctor or amchi with whom I have worked for many years, was calling from his home in the ancient walled city of Lo Monthang, in Nepal’s Mustang District. Pleasantries passed and then Gyatso got down to work. Do you have a pen and paper? He asked. I pulled out my notebook and he began to rattle off the names of about 30 different Tibetan medical compounds. Most I recognized as common formulas with as few as five and as many as twenty-five ingredients: plants, animal products, and minerals from across the Tibetan plateau, high Himalaya, and subtropical South Asia. As I wrote down these names, sensory memories flooded in, of dried pomegranate and green cardamom, of eaglewood and Chinese gooseberry, of calcium carbonate and bamboo pitch. The names of these formulas also brought forth a string of symptoms: sleeplessness and anxiety, blood and bile disorders, digestive irregularities, weakened life force. A few of the named medicines were rinchen rilbu, precious pills. These highly complex pharmacological endeavors include detoxified precious and semi-precious stones and metals. They are used sparingly, if also as panacea.So as not to fully deplete Gyatso’ own medical supplies, with which he treats his own rural community, I had brokered donations of Tibetan medicines from a reputable doctor with her own small pharmacy in India. The doctor would package up this precious cargo and send it by bus from Delhi. Gyatso, along with his brother, heads up a school and medical clinics in Mustang and Pokhara. He was beginning to mobilize several of his senior students along with a few local youths who would then head to the Village Development Committee from which one of their former students and the cook at their school hails: a region in Dolakha District that was severely damaged in the April 28 quake and then further impacted by the May 12 event. After some initial questions about where they should go, they decided on a closely hewn response: help those you know, or those you can trust to help you reach people they know. This sort of practical wisdom turns stereotypes about Nepali propensities to privilege ‘one’s own people’ (aphno maanche) on its head. As our conversation continued, the structure and form of what will likely be the first of several Amchi Medicine Clinics to emerge in response to the Nepal earthquakes took shape. 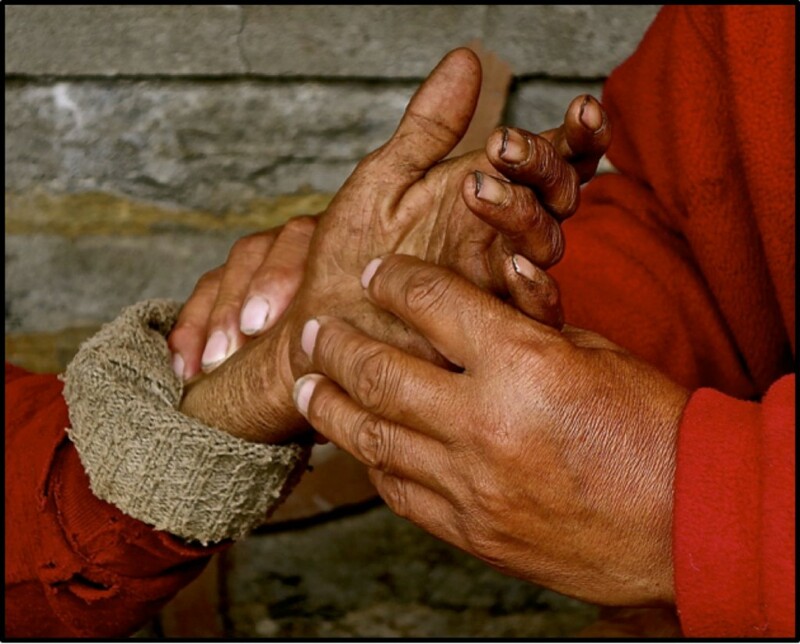 These clinics aim to provide not only Tibetan medicines and food but also to offer support through ritual practice to honor the dead and protect the living. The idea for these camps was suggested by various amchi soon after the first earthquake. Although their strategies regarding where and when to and who to send go varied, these practitioners presented a single-pointed vision when it came to the purpose of such an endeavor. They would provide culturally astute, mindful care for people living with and suffering from forms of embodied trauma that can be well served by this medical tradition. They understood that without enough to eat, medicines would bring less benefit. They knew that people would value the lighting of butter lamps, but would not necessarily have the butter to offer. The anticipated ongoing physical trauma from the work of dismantling homes but also the needed work of clearing away the spiritual pollution evoked by so many violent, untimely deaths. They spoke of the need to appease local deities of place and to reconsecrate damaged structures. Most of all, what has taken clinical psychiatry and international disaster response teams many years – and many disasters – to understand came easily for them. The awkward hyphens of bio-psycho-social meld into a different social ecology of health and illness for these practitioners, one that takes seriously the reality that the elements which make up this planet are also those which give us sentience: earth, air, fire, water, space. Amchi are at once ethnobotanists and ritual specialists attune to the living landscapes and sacred geographies of home as well as pharmacologists and physicians. The modes of knowledge transmission they represent might be considered critically endangered in an era of ‘big’ traditional pharma as well as the introduction of biomedically-derived production standards and clinical research protocols, but they know how to respond in meaningful ways at such moments of crisis. They also understood that they could perhaps be most helpful not in the immediate rescue and triage mode but in response to the settling in of suffering over these coming months, when time stretches out into new spaces of vulnerability, memory, loss. Non-biomedical health systems and various forms of traditional medicine remain a crucial avenue through which many Nepalis seek care for chronic and acute illness, including mental health and responses to trauma. Nepalis rely on Tibetan medicine to address their health concerns, both in rural villages along Nepal’s northern border and in urban clinics, where patients represent Nepal’s ethnic and cultural diversity. Also known as Sowa Rigpa, the ‘science of healing,’ this medical practice is less formally recognized and supported by the Nepali government than Ayurveda, even as amchi work at the frontline of care for many of the country’s high mountain communities. As Nepal’s amchi move forward with their planning, they will work closely to coordinate with other relief organizations working in these areas. Their aim is not to reproduce the infrastructure of aid delivery but to connect directly to such efforts while providing distinct forms of care. I hope that such efforts by highly skilled Tibetan medical practitioners might dissuade – or at least provide a counter-example to – those biomedical aid workers who have decided that it is acceptable to just pluck up some traditional medicines and, with rudimentary translation of symptoms and no training in proper diagnostic methods (pulse and urine analysis) or understanding of the clusters of imbalance such medicines are meant to address, hand them out to people anyway. This is another form of biomedical hubris and a certain type of cultural violence, seeping in around the edges of right motivation. Imagine the pushback if a Tibetan physician were to show up in an emergency room and begin prescribing anti-psychotics and blood thinners, willy nilly. Although these amchi medical clinics are proposed within an ephemeral ‘camp’ structure at present, such effort may represent an opportunity to re-imagining post-quake healthcare infrastructure in ways that more directly incorporate practitioners such as amchi into the provision of primary health care. The foundation for such work exists, as amchi are marginally recognized (if not supported by) Nepal’s Department of Ayurveda within the Ministry of Health, and through the Council on Technical Education and Vocational Training. Full-scale support for and integration of amchi into public health infrastructure remains a dream in Nepal, even though this is the reality in places as politically distinct as Bhutan, Mongolia, and Tibetan regions of China. Working with amchi on these clinics – including raising funds for them through DROKPA, an all-volunteer non-profit organization I co-founded in 1999 — has been one of the ways I’ve chosen to respond to the Nepal disasters as a medical anthropologist. I’m also incorporating younger amchi into collaborative research teams that will investigate responses to these events in three contiguous districts (Mustang, Manang, and Gorkha) through an NSF RAPID award of which I am a part. I chose to open this blogpost with the words of Rudolf Virchow even though I know that he and many of Nepal’s amchi would see the relationship between what Virchow calls ‘faith’ and its relationship to medicine and science quite differently. Despite these epistemological divergences, I think they would all agree on fundamental premises of being of service and seeing the individual body as a microcosm of the larger social, ecological, and political worlds to which one belongs.